All good things must come to an end. Having redefined cinematic storytelling and blockbuster spectacle for gaming back on PS3, Nathan Drake bows out with his first and final bespoke PS4 outing in what is quite possibly developer Naughty Dog’s greatest achievement to date. Uncharted 4: A Thief’s End is an astonishing technical showcase for the PS4, closing the franchise with the biggest and most ambitious instalment ever, and further affirms Naughty Dog as masters of design and writing. It expertly builds upon and ties up the narrative foundations laid out in the previous games and refines the core gameplay systems and mechanics to become intuitive and seamless, while the influence of Naughty Dog’s other gaming masterpiece, The Last Of Us, can be keenly felt throughout. Simply put, it’s the grand series send-off we all hoped it would be and the one Nate and co absolutely deserve, but it might not necessarily be quite the one you were expecting. Come into Uncharted 4 anticipating another thrill-a-minute rollercoaster ride in the vain of Uncharted 2 and 3 and you’ll find yourself thinking A Thief’s End falls short of the lofty heights set by its previous set-piece-laden bonanzas. While Uncharted 4 is still recognisably Uncharted and most definitely has its fair share of high-octane action sequences and death-defying stunt work in amongst the usual bouts of cover-shooting and platforming, this is a comparatively slower, quieter and sombre Uncharted than we’re used to. More than ever it is, fittingly, the characters and their relationships with each other which drive this climactic adventure to its emotional crescendo. Naughty Dog gives them and the story plenty of breathing room in between the adrenaline-fuelled escapes and chases, and once you adjust your expectations and preconceptions accordingly, Uncharted 4 shines. Of those relationships, the most important one in Nate’s life is of course with his journalist wife, Elena, but it is the bond between him and his presumed dead brother, Sam, that takes the spotlight during the opening acts. Having spent the intervening years since the last game living a ‘normal’ life – getting a job, buying a house and, in one the game’s many cool winks and nods, occasionally partaking in some old-school videogames which star a certain Bandicoot – Nate is shocked to find his long-lost brother standing right in front of him. After some brief but much needed catching up between them (featuring the first of few uses of Uncharted’s all new, and somewhat superfluous, dialogue choices), Sam reveals he’s in some pretty deep trouble and needs Nate’s help. And so the pair are thrust into a globetrotting adventure, taking in the exotic sights of Italy, Madagascar and, er, Scotland, in a race against a deranged rival treasure hunter to find famous pirate Henry Avery’s buried loot. In a game as story-driven as this, it would be unforgivable to divulge more. This being the supposed last Uncharted, discovering all of the surprises, twists and revelations of the story for yourself will make them all the more impactful. Luckily, there is still plenty about it which can be discussed without getting too spoilerific, like how well the never-before-mentioned older Drake brother slots near seamlessly into canon. There was, quite unavoidably, always going to be an element of contrivance in Sam’s out-of-the-blue appearance, but the plausible enough explanation for his until now nonexistence is explained early doors, and the overbearing weight it places on his younger sibling as a result is understandably the reason Nate has never talked about him before. You could go back and start picking holes if you really wanted to, but it’s not as if Uncharted has never asked us to suspend our disbelief before. As for Sam’s character, it’s immediately evident he and his brother are cut from the same cloth. Charismatic, wisecracking, charming – yep, he’s definitely a Drake. A typically strong performance from Troy Baker helps sell Sam as another likable yet mysterious addition to the Uncharted family. Baker is, after all, the man who brought BioShock Infinite’s Booker DeWitt and The Last Of Us’ Joel so memorably to life. We’re never too sure on whether we can fully trust Sam, but at the same time he’s so much like his brother, without being too alike, that it’s hard not to warm to him. Not to be outshined, though, are Emily Rose as Elena and Richard McGonagle as Sully who likewise act their chops off, while newcomers Warren Kole as smarmy rich-boy-gone-mad antagonist Rafe Adler and Laura Bailey as his hired muscle, Nadine Ross, similarly impress. Yet, it is leading man Nolan North in the best portrayal of his career-defining role who reminds us he is the beating heart of this swashbuckling series every bit as much as his alter ego. The prolific voice actor brings Nathan Drake to the screen one last time with heartfelt fervour, and while no doubt we’ll continue to hear his instantly recognisable tones in more games in the years to come, it stands to good reason this character and this game will be the one he’s most fondly remembered for. Neil Druckmann and Josh Scherr’s sharp and witty script is just as praiseworthy. Despite a seemingly darker outlook for the story, Uncharted’s endearing sense of humour remains intact, the Drake brothers often quipping their way through encounters while Sully once again gets a share in some of the game’s best lines. Those sly winks and nods mentioned earlier will often raise a smile, too. But what truly elevates this above other games’ scripts, though, and even previous Uncharteds for that matter, is the deft skill in which it effortlessly interweaves the laughs with the more serious motifs. Being the last Uncharted, being subtitled A Thief’s End, there’s a palpable aura of poignancy which can be felt from the first minute through to the last. It gets especially intense during the game’s third act as it inevitably ramps up to a tension-filled finale where the stakes have never been higher for the cast or, indeed, the players who’ve been following every step of the way for the last nine years. With equal amounts of heart-warming, reflective and beautifully quiet moments contrasting with some heart-stopping instances of pure dread, some players may find their emotions getting the better of them in the final few hours, Henry Jackman’s superb score (taking over from series regular Greg Edmonson) only heightening those feels. With such strong pedigree, the cast’s acting abilities and Naughty Dog’s storytelling prowess was never in any doubt. 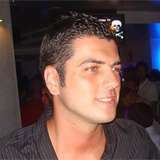 Neither, too, was the game’s technical performance. 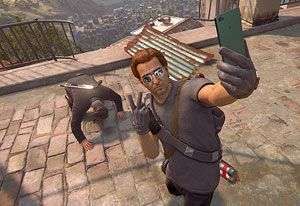 Naughty Dog have always been at the forefront of PlayStation development, having eked out more power than most from every Sony console, and Uncharted 4 continues their time-honoured tradition. It is hands down the best looking game on a console, with some of gaming’s best facial animations and use of motion capture, stunning cinematography and seamless transitions between in-engine cutscenes and gameplay. The full 1080p resolution with near-unwavering framerate generates some gorgeous picture-postcard panoramas of the most dense and detailed environments in Uncharted history. They’re much larger environments, too, usually offering to multiple routes to your destination, while some chapters forgo the customary linear layouts in favour of a more sandbox vibe. 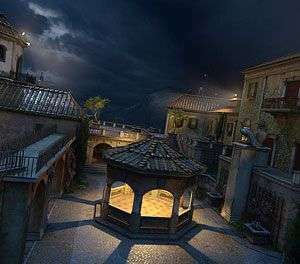 Uncharted isn’t going open-world, though – this is still essentially a tightly directed, cinematic experience – but on occasion levels will expand so greatly they require use of a vehicle to negotiate. 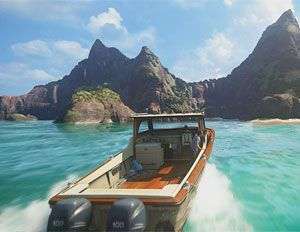 One chapter midway through the game sees Nate and Sam sailing amid a cluster of small, remote islands following a succession of clues. Others, meanwhile, will sit you behind the wheel of a jeep as you freewheel across the Madagascan savannah or through a thick, tropical jungle. While there is naturally a critical path to follow, you’re permitted the freedom to travel off-piste to search hidden caverns and long-forgotten ruins for some craftily hidden collectibles, lending the game a sense of discovery some of the narrower levels lack. Collectibles aren’t just the traditional treasures from games prior either, but also include journal entries and notes which help flesh out the archaeological expedition, and are well worth seeking out. You’ll often see Drake scribbling in his journal, penning his thoughts and finds which can sometimes be pointers to aid in puzzle solving, while others can just be his usual silly doodles. Plus, you might be rewarded with some optional conversations for your efforts, too. The most sprawling levels are normally the most peaceful, allowing you to explore unhindered by pesky goons with guns intent on spoiling your fun. But levels which do involve a spot of return fire or light-footed neck-snapping can similarly take on sandbox traits. Generally speaking, these are vaster spaces than in the past and accommodate more choices in combat and stealth. Think back to Uncharted 3’s ship graveyard, which allowed you to dive underwater, circle around guards and climb atop structures for a higher a vantage point. Now imagine that size and style of level, only wider, longer and filled with more options, yet retaining the focus of the more structured areas. With an increase in scope, sneaking has naturally seen the requisite enhancements and can now play a much bigger role in your playstyle. Nate will often enter areas undetected and, with a bit of luck and patience, can even exit them with enemies none the wiser to his presence (there are even a few Trophies up for grabs for ghosting specific parts). The ability to tag guards, and indicators atop their heads denoting states of awareness are greatly appreciated in larger spaces when trying to be more pacifistic, even if it does take away some of the unpredictability which made stealth in The Last Of Us so nail-biting. There are also patches of tall grass you can lurk in, waiting to pounce on your prey like a Velociraptor, and, if close enough, Nate will instinctively pull them back into the foliage to conceal them. If you do get spotted, you can just as easily run back and hide to resume your quieter murder spree, but guards will actively be searching for you from then on. It all adds up to stealth feeling much more freeform and dynamic, almost like a third-person Far Cry (only with infinitely less detestable characters), whereas in previous Uncharteds stealth was less flexible, getting noticed resulting in a no-returns firefight. However, while you’re more than welcome to retreat and hide in order to continue creeping through sequences that permit it, sometimes getting caught out in the open can be the most exciting. Both shooting and brawling have similarly been beefed up, weapons sounding punchier and a host of contextual animations making Nate’s scrappy style of punch-ups all the more satisfying. The AI puts up a good fight, too. Hunker down behind cover (some of which is destructible) and they’ll try to outflank you and flush you out with grenades. Attempt to yank them over an edge and they’ll frequently try to resist, either by knocking Nate down first or desperately grabbing hold of his foot in a last ditch attempt to live, or at least bring him down with them. Luckily, partner AI is equally savvy, pointing out enemy patrols, silently taking out opponents, given the opportunity, and only going loud when all hell breaks loose. More fortunately, enemy AI is only reactive to seeing you when taking things stealthily, so when partners do occasionally break the immersion by crossing their line of sight (a problem shared with The Last Of Us), they don’t take any notice. Nate’s new grappling hook also comes into play during fights. With more verticality to level design, Nate can swing across gaps to quickly close the distance and automatically land an extravagant aerial takedown on anyone unfortunate to be standing underneath. It’s the last ingredient in a combat system flowing with possibility. With so many points of attack, persistent AI, and some new moves and tools to play with, proceedings are lent a frantic sense of improvisation. In the best kind of way, you rarely feel in control, how you think an encounter will play out when going in never quite being the case when coming out. Less unpredictable, but no less thrilling, is Uncharted’s electrifying brand of vertiginous platforming. Once again Nate finds himself scaling sheer cliff faces by the tips of his fingers, as ledges give way, handholds crumble, and jumps are barely saved by an outstretched hand. It’s standard Uncharted fare, then, only better, prettier, and more responsive. With the left analogue stick controlling the direction of Nate’s reaching arm, climbing feels smooth and intuitive, simultaneously showing off those impressive animations. The aforementioned grappling hook also shares an equally prominent role here as it does in conflict, but the piton, acquired late in the game, gets less of a look-in. Both are welcome additions and fit the mould perfectly, but it’s fair to say neither drastically alter the way you approach platforming, in that you’re only looking for the next predetermined grapple point much like you do the next handhold. 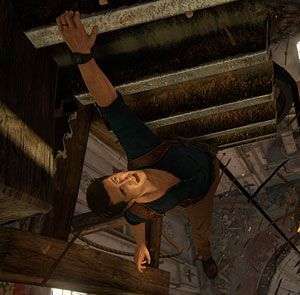 Clambering up cliffs, buildings and other obstacles remains a straightforward affair, then, but Uncharted’s platforming has always been more about the cathartic thrill and rousing spectacle of navigating such dangerous heights. What is meant to challenge are the game’s selection of ancient puzzles and mechanisms. These are a varied bunch, often testing your levels of perception as much as your ingenuity, and probably rank amongst the cleverest in the series, if not quite the grandest. There are the expected archetypes of interacting with objects in sequential order, while others will actually make you stop and concurrently think through your next move and the moves thereafter. It’s usually these moments where you’ll pull out the journal for an idea of what to do, and for one specific conundrum halfway through the story it can play an almost vital role in working out the solution. By no means are these the best puzzles you’ll ever play, even in an action game, but they nonetheless help add to the charm of being on an archaeological adventure, and as always play an important part of the overall experience. 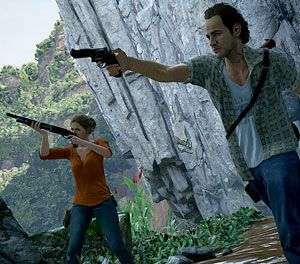 Now, as undoubtedly magnificent and awe-inspiring Uncharted 4 is, it’s not without its nit-picks, and they’re mostly the same nit-picks which have always dogged the series. Enemies can absorb a couple of bullets too many, mechanically there are games which do both shooting and stealth better, and certain sections suffer from steep difficulty spikes. There were also a couple of minor technical wobbles, characters’ hands clipping through scenery on one occasion, while on another Nate briefly decided to do a T-pose in the middle of the screen. And then of course there were the rare immersion breakers, as previously noted. All minor gripes, sure, but how do those famous set-pieces stack up? Honestly, barring the opening five minutes and a Raiders-besting car chase midway through the campaign (which remains an exhilarating rush to play no matter how many times you’ve viewed the E3 demo), Uncharted 4’s big action sequences relatively disappoint. They feel fewer and farther between, which isn’t necessarily a problem, but there’s definitely a sense we’ve seen some of these before. Have Naughty Dog run out of ideas, or are they paying homage to their former glories? Whatever the case, they’re still orchestrated with a cinematic flair and panache few other games can match and, most importantly, you remain in control. While there’s little to rival the second game’s Nepalese rooftop chase and runaway locomotive, or the third game’s sinking cruise liner and desert plane crash, these are still a league or two above the rest of the competition. The pacing could also be called into question. This is the biggest Uncharted yet, not only in scope but also in duration, clocking in at around sixteen hours, approximately twice as long as any of the previous games. It’s partly because this is a deliberately slower and more sedate Uncharted, and some may find that a problem, initially at least. While admittedly it wouldn’t hurt to have a few minutes chopped off in places, as you progress further through the story and experience the bigger picture, the slight tonal shift and resulting slower pace begins to make sense. As mentioned earlier, it’s a case of managing expectations– it is the characters and the story which are the driving forces here, not the action – and for some it may not be until the final act when this happens, where the emotional payoff, which has been building up all the way through, suddenly makes it all click. Where does this leave new players? They’ll get less out of it than longstanding fans will, but with The Nathan Drake Collection available on PS4 there’s no excuse for you not to be up to date with the story so far. It’s that powerful connection which makes Uncharted 4 arguably the best in the franchise, and arguably Naughty Dog’s best game to date. They couldn’t sign off this series on a higher note; send-off these beloved characters in a more fitting end. Make no mistake, this is the definitive end for Uncharted as we know it, and as the credits roll and the realisation washes over you that this is indeed the end of an era, you can’t help but crack a smile and maybe even shed a tear as one of the most treasured sagas in gaming history comes to a close. While the campaign is indisputably the main event, there’s one hell of an after-party going on in multiplayer, and everyone’s invited. Eddy Raja, Chloe Frazer, Charlie Cutter and more all return to wish Nathan Drake a happy retirement as Uncharted heroes once again go head-to-head with Uncharted villains in an accessible multiplayer mode, which wisely doubles the framerate to 60fps while lowering the resolution to 900p, and embraces the more supernatural side of the franchise. Mysticals are special abilities inspired by artefacts from the series’ past and can be purchased mid-match with cash earned through play. They range from the evil spirit-dispensing Wrath Of El Dorado, teammate-healing Cintamani Stone, and radar-boosting Staff Of Ayer Manco. Also for a price, you can spawn in Sidekicks, AI allies who act as support, filling roles of medics, snipers and mingun-wielding brutes. On paper it’s a mixture which should result in a disorderly and unbalanced mess, yet everything plays nicely together and allows even inexperienced players to get a sturdy foothold on the ladder. Throw in a rewarding progression system, a wealth of customisation options, and a varied selection of maps, and you’ve got the strongest online offering Naughty Dog’s ever produced. The only downside is a lack of modes, with Team Deathmatch, Ranked Team Deathmatch, Command (King Of The Hill) and Plunder (Capture The Flag) the only available options at present. Naughty Dog are promising to deliver more content in the coming months for free, though, including co-op, but as it stands, there’s enough quality in the base game to readily recommend taking it for a spin after you’ve recovered from the campaign, making Uncharted 4 a success on all fronts. Goodbyes can be tough, and bidding farewell to Nathan Drake, gaming’s most lovable mass murderer, will run you through a whole gamut of emotions. It’s funny, tense, sad and more, often all at the same time. At least we can take comfort in knowing he leaves on an all-time career high. Yes it’s a swansong with flaws, much like its leading hero. But also just like its star, it’s got a big heart, and that’s what makes Uncharted 4 so uniquely and utterly special in a series already highly revered for its engaging storytelling qualities. As for Naughty Dog? Well, we can’t wait to see what they do next. So long, Nathan Drake. It’s been an absolute pleasure. Great review. I don’t currently own a PS4, so not sure I’ll ever get to play this, however the first 3 games are some of my all time favourites. It’s sad to learn that there won’t be any further games.